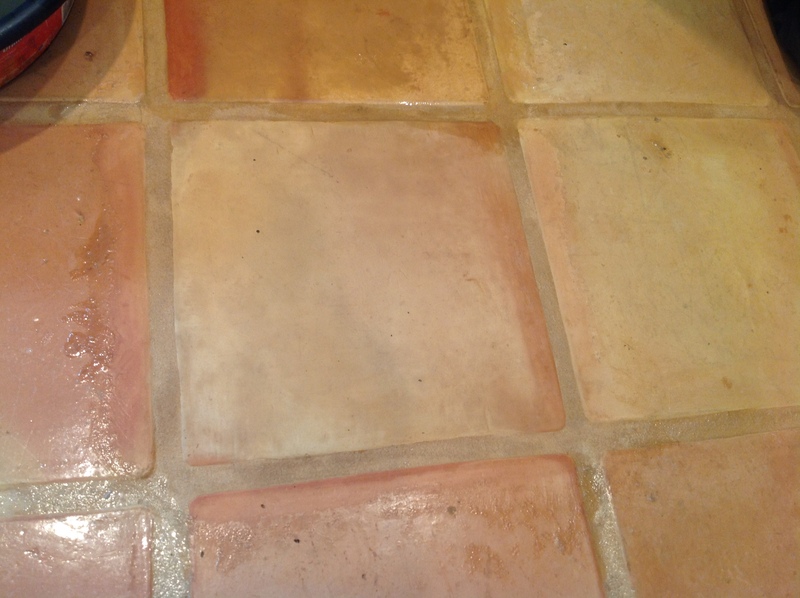 When a sealed Saltillo tile is scratched and etched, there is an open invitation for dirt, grime, acids, water damage, and bacteria to come into the tile and deteriorate it over time. 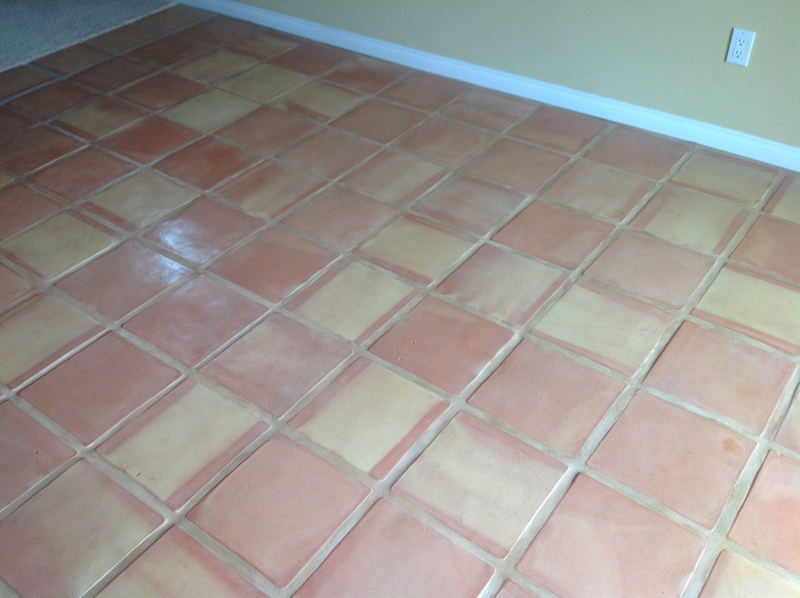 Inside Mexican tiles are a little more durable and will hold up years longer when sealed correctly with proper Saltillo maintenance, due to no weather or sprinkler problems usually. 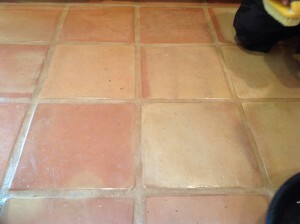 Outside Saltillo patios and ceramic tiles have to be sealed without topical coating sealer due to severe weather damage. 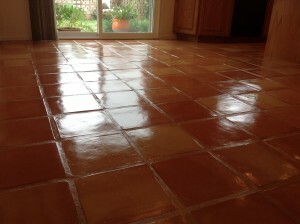 In the pic This Saltillo floor also had a rubber bottom rug, which over time bonded with the sealer. OH NOO! 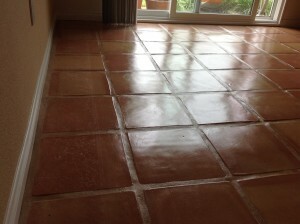 Not an uncommon problem with Saltillo tiles. Saltillo flooring in this home in El Cajon California just outside of San Diego, was stripped, re-sealed, and refinished by the home owners (not too bad though huh? 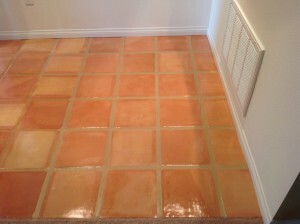 ), and they added about 30 paver tiles to a hallway, where they put in grey grout, but the existing grout was Sahara Tan. 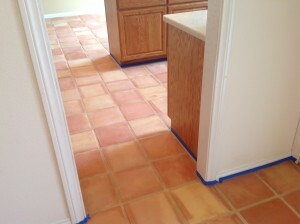 The Saltillo tiles and the grout on this 300 square foot project was actually clean and free of dirt. 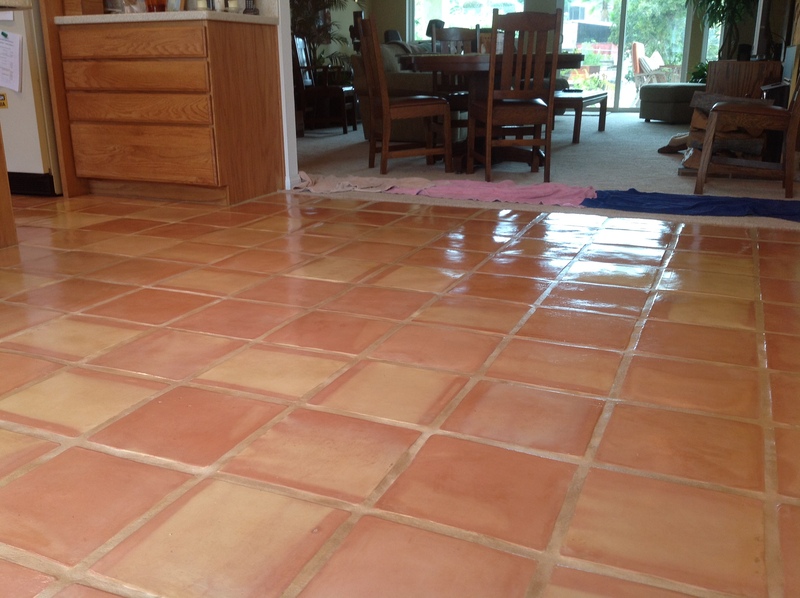 The CHALLENGE was the Re-applied sealer by the home owner, which started to peel and turned out blotchy and streaking through out the entire floor. 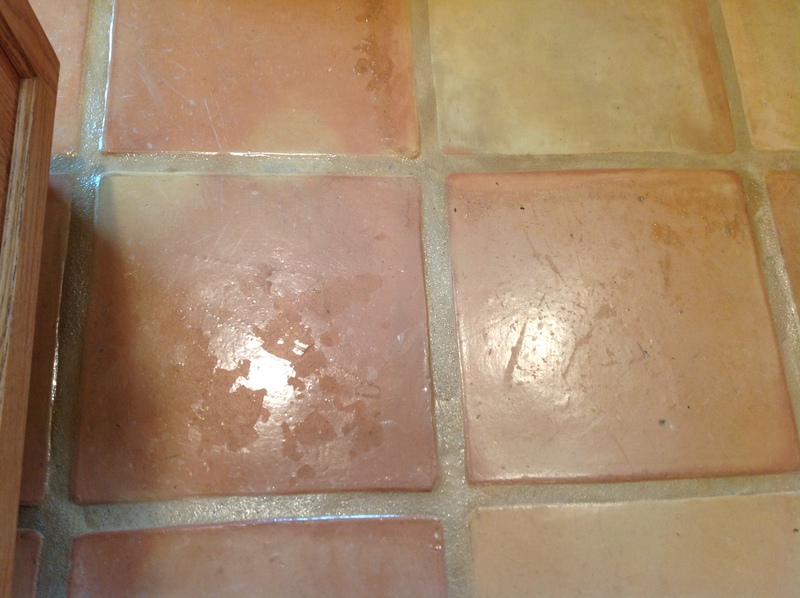 Where does the Saltillo Tile Peeling and Blotching Come From? 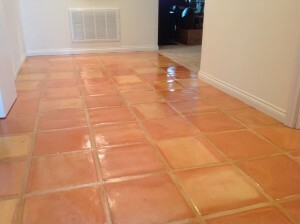 And do you think they stopped there? No, they kept putting on more layers of sealer thinking that all patches would fill themselves in, and all those blotchy areas would just go away. 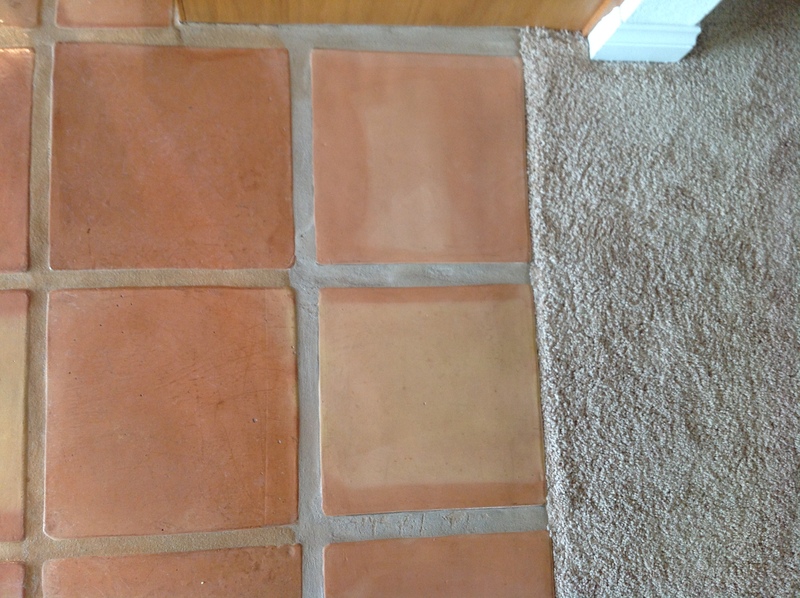 It really just makes it worse. 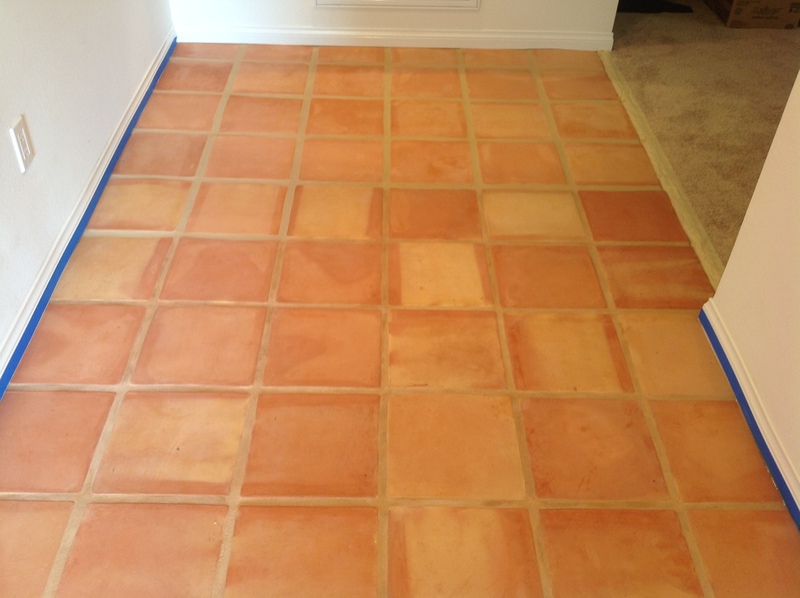 We completely stripped off all the existing sealer, wax, and dirt off of the Saltillo tiles and the grout by hand, making sure to be extremely detailed not to miss any of the existing finish. 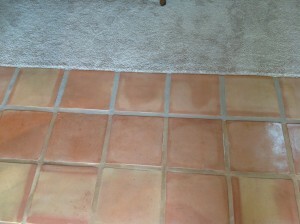 In these pics you can see we just started the sealer removal process, and there’s an immediate difference. 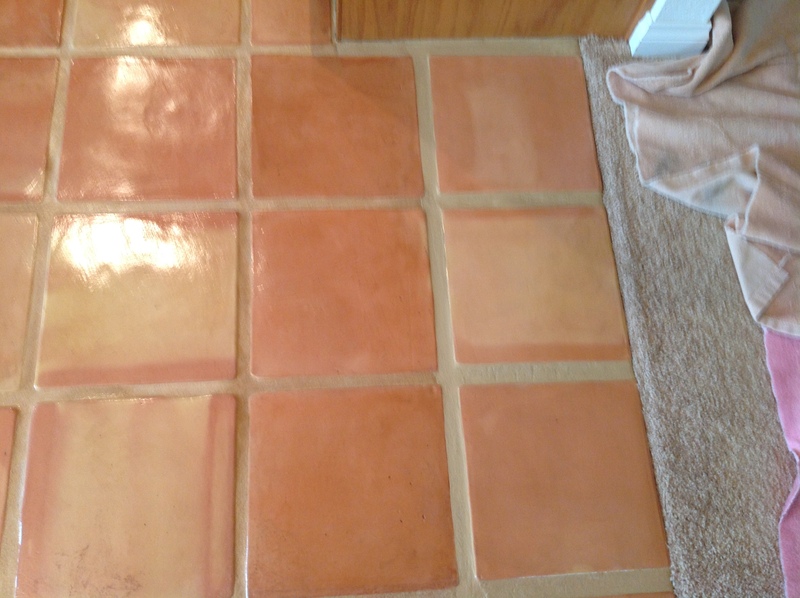 You can also see the grey grout patch job that doesn’t match the existing Sahara Tan grout. You can see see in these pics the Saltillo tiles are stripped, cleaned, detailed, and ready to be sealed. 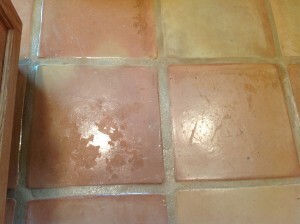 You can also see we blended in the grout repair, with a little color match. 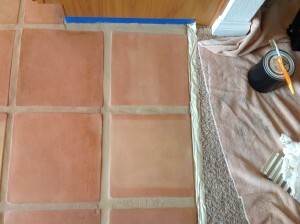 It’s not perfect, but its better than grey. In these after pics you can see how beautiful the Saltillo floor came out after we applied the high shine and how well the grout blended. 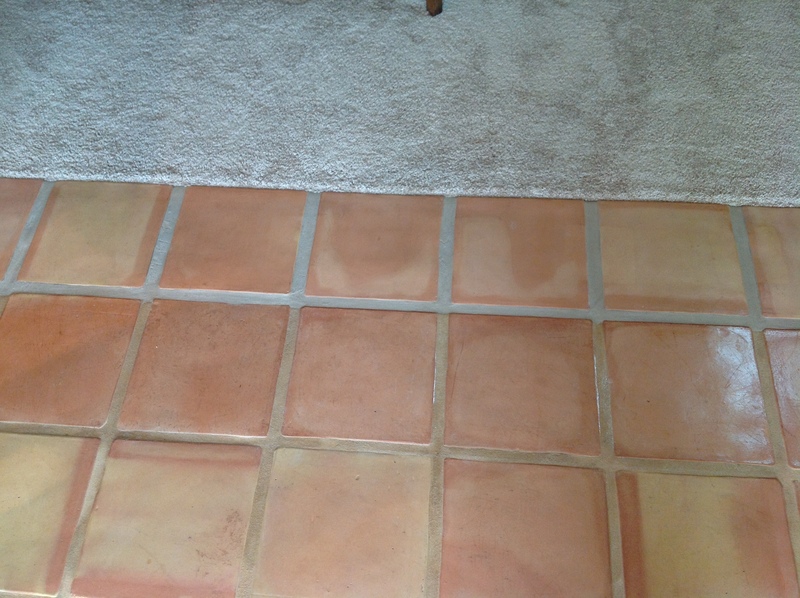 Marin County, Tiburon, Belvedere, Mill Valley, Sausalito, Corte Madera, Larkspur, Kentfield, Greenbrae, Sleepy Hollow, San Anselmo, Fairfax, Inverness, Stinson Beach, Bolinas Beach, Bodega Bay, San Marin, Novato, San Geronimo, Ignacio, Blackpoint, San Rafael, Terra Linda, Santa Venetia, Marinwood. CTR restores 12 x 12 Saltillo tiles in Sonoma County and surrounding cities such as Glen Ellen, Yountville, Napa, St. Helena, Saratoga, Napa Valley, Wine Country, Santa Rosa, Windsur, Cotati, Rohnert Park, Pengrove. We refinish and clean Saltillo tiles by hand in San Francisco, Sacramento, Auburn, Folsom, Vallejo, Berkeley, Piedmont, Concord, Walnut Creek, Danville, San Ramon, Orinda, Alamo, Lafayette, Moraga, Milpitas, San Jose, Walnut creek, Los Angeles, Encinitas, San Diego, Sherman Oaks. Saltillo floor refinishing in San Mateo, Foster City, Daly City, South San Francisco, Davis, Dixon, Rancho Santa Fe LA, Orange County, and much more.